Jackrabbit offers great flexibility in reporting with over 100 reports for families, students, classes, staff, enrollment, financial information, and more. Many of these reports are located throughout the various menus (Families, Students, Classes, etc. ), however, all reports can be found in the Reports menu. 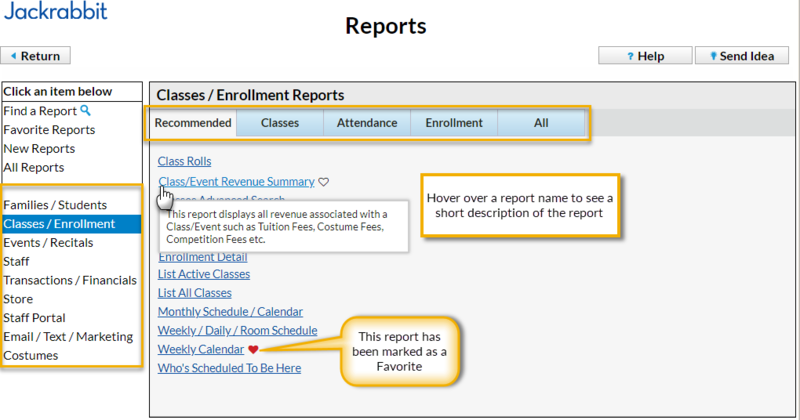 The Reports menu offers four ways to help you locate the report you are looking for. Visible from Find Reports, Favorite Reports, New Reports, and All Reports, report categories group related reports together. Tabs provide further breakdown within each category. Note: Reports may be found in more than one category or within multiple tabs in a category.